The next day, we went to see some things in McKenna’s town. We went to the Ministry of Justice where her Giving and Receiving ceremony took place. 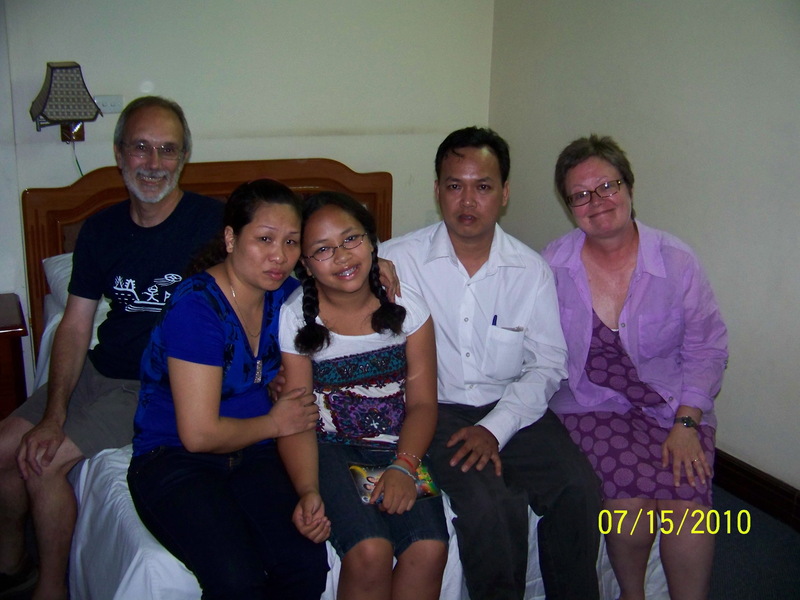 And I now know that the reason Thao (I am using a different name for McKenna’s birth mother to preserve her privacy) was not there not because she “went to visit a friend” which is what I was told by the adoption facilitators in Vietnam. But that she was given too short a notice by them to be able to get back from the town she was working in to be there. We went to a museum “of the people” which was really cool and Steve got interviewed by a new organization about what he liked there. We stopped and bought McKenna’s little sister a birthday present and tried to find something for her little brother but nothing we found at the store we stopped at worked and so left without anything for him. And we felt very badly about this. The time was getting close for our second meeting and we needed to get back to the hotel and get cleaned up. McKenna asked me all day about whether or not she was going to get to meet her brother and sister. And I just did not know. I wasn’t sure how this situation would be explained to them. “You have a sister who has come from America. She won’t be staying….” I didn’t know how they would explain it. I had been nervous all day with an underlying fear of one thing. Meeting the grandparents. What if Thao’s mother, who I met at the Ministry of Justice 12 years ago, was not the grandmother who came tonight? Then that would mean that these lovely people were not really McKenna’s birth parents. And we would be in a pretty emotionally icky situation. One that we would all be doggy paddling in. 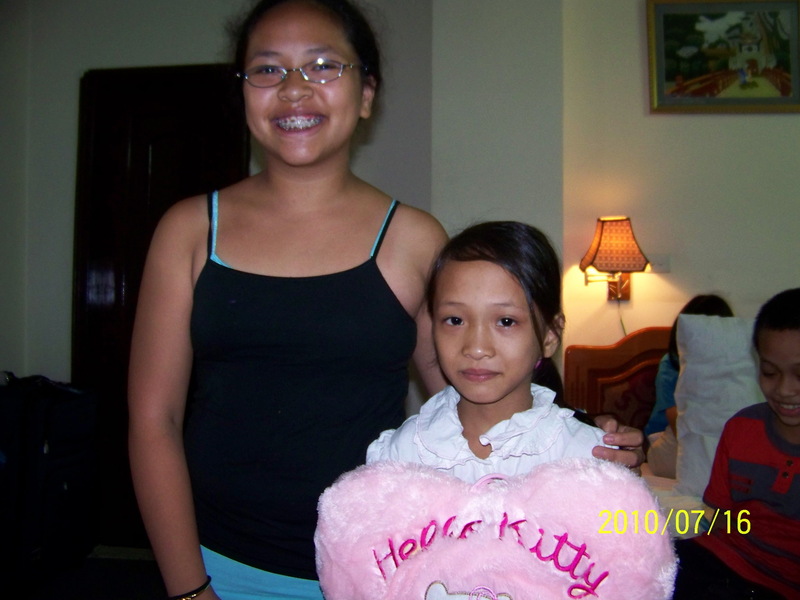 Luckily, when the knock on the door came that evening and in walked Thao’s mother, it was the lady I had met and I hugged her with a lot of relief. She remembered me too and we had our picture taken together. This meeting was when McKenna’s birthfather’s magnanimity and personality came through. He first presented McKenna with a beautiful bracelet. He had drawn on the box where he also put his name and the date. He presented both Steve and Sheridan with embroidered scenes that are famous in Hanoi area. We took lots of pictures of these presentations. He and Steve drank beer together at dinner. His sense of humor showed through and we now know where McKenna gets hers! Before we had dinner with them, we took a lot of pictures of all of us together. We had a wonderful dinner with the whole family and, in retrospect, I so wish that I had known some Vietnamese then so I could spoken with McKenna’s grandmother. She was the main connection we had to McKenna’s past and I wanted to tell her how much her rush to get to the Ministry of Justice that day 12 years ago meant to me. I wanted to tell her how heartbroken I was taking her granddaughter away….seeing how heartbroken she was. 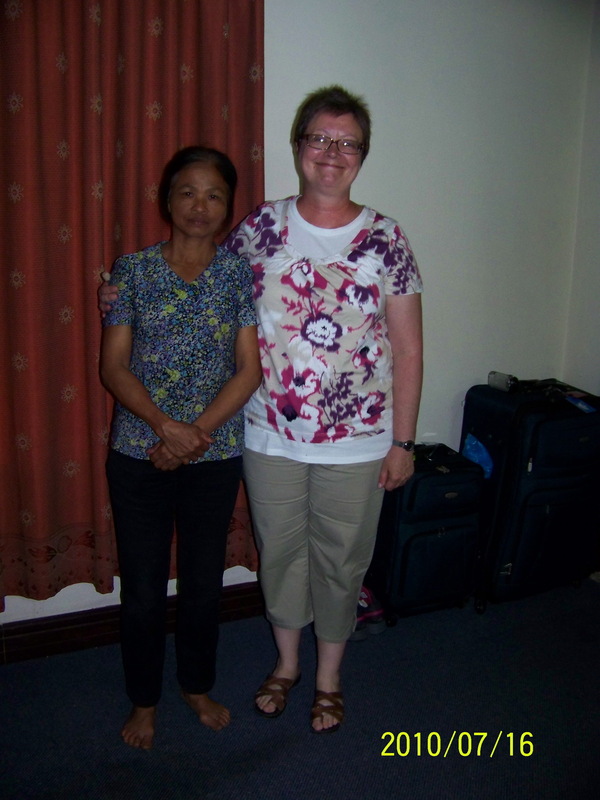 What we did not get to do was really spend any time alone with McKenna’s birthmother Thao. The next day presented that opportunity for me for a few minutes but I blew it. The last part of this series will be posted in a few days. Feel free to subscribe to kidsarefromasia blog by clicking on the Sign Me Up! button above and on the right and follow me on Twitter at @kidsarefromasia. Hey, kid, look at me. But who do they see? The nurse just called me ‘father’. Well, hell, I guess that’s what I am. How can you know what it’s worth? McKenna and I spent about 30 minutes working on her hair. She has very wavy, curly long hair. And it had been awhile since she had gotten the underneath part brushed properly. We were both nervous. I could tell she was nervous because she kept asking me questions. Mostly ones I couldn’t answer. Why did my birth father come back and marry my birth mother? What is his name? I have a brother and sister? What are their names? What kind of store do they have? The elephant in the room was of course if they stayed together, then why did they give me up? She didn’t ask that question out loud, but it was there hanging around us as I worked through her tangled hair. We decided on braids for her hair and a different outfit. She fretted about everything. Looking back at the photos we took, she seems like such a little kid compared to almost a year later. She has turned into a young lady in such a short time. And the things that must have been going through her head and heart as we waited for them to arrive………..
Then there was a knock on the hotel room door. And suddenly the moment was there. The door opened to two people who enveloped her the minute they saw her. They hugged and held her away to look at her, their flesh and blood. So long ago gone from them. McKenna cried. They cried. Steve and I were crying. And we had no tissues. They sat on the bed with McKenna between them holding her tight and we exchanged questions through Mr Long, our guide and sudden interpreter, for about an hour. I had brought a photo album that chronicled many of McKenna’s important moments. Her first step, first day of school, school programs. The picture of her birth grandmother holding her. Why did you give up McKenna? The reason was a circumstance from his family that was very compelling but was remedied too late for them to keep her. But then he worked through it, came back and he married Thao. He did most of the talking and answering of questions. He turned out to be a very nice person, not who I envisioned. He told us they would make no requests except that McKenna be able to meet her grandparents and of course we were more than willing to have her meet as many members of her birthfamily as possible. We arranged for another meeting the next evening which was McKenna’s little sister’s birthday. After they left, McKenna and I lay on the bed and took silly pictures of ourselves. What had happened that evening was just too much to talk about. We goofed around instead and went to sleep that night in anticipation of the next evening when she would get to see them again and get to meet her grandparents. I don’t know how she could have slept very well. And I wonder what they talked about the rest of the evening. Này, cậu bé, nhìn vào tôi. Nhưng họ làm những người nhìn thấy? Các y tá chỉ cần gọi cho tôi ‘cha’. Vâng, địa ngục, tôi đoán đó là những gì tôi. Tôi là một người đàn ông trong gia đình? Làm thế nào bạn có thể biết những gì nó có giá trị? Please feel free to subscribe to the kidsarefromasia blog above and please feel free to follow me on Twitter. “My children, I miss you. How much, you can’t know. I laughed with you, I cried with you. Helped each of you grow. I kissed you every bedtime. Your laughter woke me every dawn. Then one day I woke and you’d grown and gone. Strange how kids measure your worth. I had just gotten off of a conference call with Rosetta Stone. I had been speaking with one of my Rosetta Stone Studio Coaches, a native Vietnamese speaker and one of the nicest people ever, also a Rosetta Stone employee. We had been trying to get on a conference call with my daughter’s birth parents in Vietnam to tell them Rosetta Stone wants to give them some language learning software. But it wasn’t quite working so we had just hung up when our home phone rang. It looked like a strange number. I don’t usually pick up when the number isn’t one I recognize. Sales people…. I quickly put her on the phone to say “Chào bố,” or “Hi father.” She pronounced it pretty well! It released a torrent a Vietnamese from him and she looked at me helplessly. One she lives with and one we knew nothing about until last summer. When we left for Vietnam and China last summer, we knew we wouldn’t get to meet Sheridan’s birth family. We had no names and no contacts. But for years, I had wondered if we would ever meet McKenna’s birthmother. When I read through the adoption papers, including the letter explaining why she had given McKenna up, there it was…..because the father would not marry her. As a woman, I could not help but side with her. All my thoughts and sympathies were with her. My fantasies revolved around a beautiful reunion between birth mother, grandmother and daughter some day. What kind of man, in that culture especially, would get a woman pregnant and then leave her? And after that, I barely gave him another thought. So there we were in Thai Nguyen getting ready for dinner at our TWO star hotel. Mr. Long and our driver had gone out to look for McKenna’s grandmother. 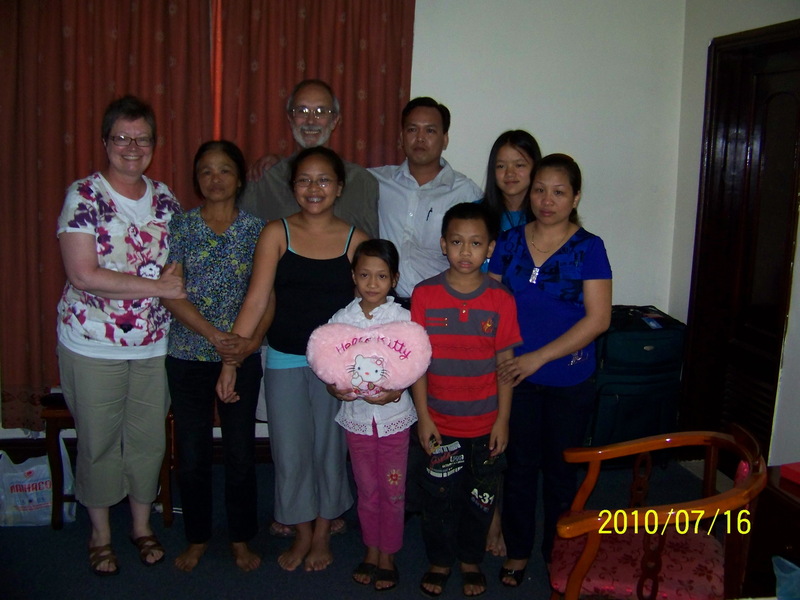 When he returned, we sat in the 110 degree hotel lobby and he told me that McKenna’s birth mother had NOT moved away. That she had a store right near the entrance to the community where she had grown up. At least he was pretty sure she was the birth mother. The name was right and he told me, she looked just like McKenna. The same nose and the same wavy hair. The same wavy hair. She wanted to meet McKenna…………. I went numb. It feels like you must feel when you get your biggest wish ever. And then I got nervous. What about her husband?? How would he feel about her having had a child from before. I didn’t want to jeopardize her current situation in any way. He must have seen that on my face. ………….I temporarily lost my hearing…………..
And a birth father. He stayed. Came back. He didn’t abandon her. I sat down at the table and looked at my husband. He had no idea what was going on. I took a deep breath and turned to McKenna and asked her if she wanted to meet her birth mother and father and she looked at me over the top of her glasses and slowly said yes and we went upstairs to get ready for the meeting of a lifetime. Đây là bốem, đây là mẹ em. “Các con tôi, tôi nhớ em. 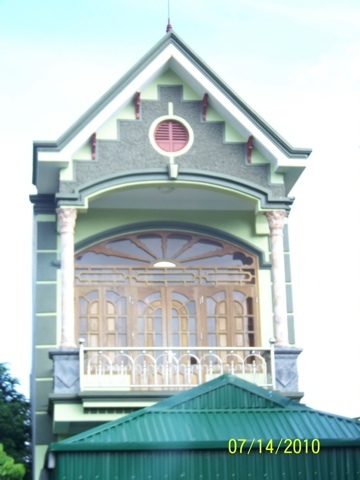 Bao nhiêu, bạn không thể biết. Tôi cười với bạn, tôi đã khóc với bạn. Giúp mỗi người phát triển. Tôi hôn người bạn mỗi khi đi ngủ. Tiếng cười của bạn đánh thức tôi mỗi bình minh. Sau đó một ngày tôi tỉnh dậy và bạn sẽ trưởng thành và biến mất. Lạ như thế nào đo lường giá trị của bạn trẻ. Part Two of this three part series will be posted on Rosetta Stone’s Blog site: http://blog.rosettastone.com/ in a week or so. Happy Mother’s Day to the birthmothers of McKenna and Sheridan. Every Mother’s Day I can’t help but think about the series of events that led to the fortune of my getting to be a mother. And to be the mother of these two specific girls…. There are these two other mothers, who for different reasons couldn’t continue to keep them. So, hey. Too bad for them? Great for me? (A sad little yay, escapes my lips). And while I always marvel over the wonder of being blessed with my girls, I can’t help but think of these two women, also mothers of these two girls and the circumstances that did or might have led to my fortune. One mother, in China, had to leave her baby girl somewhere and walk away from her, in winter, at the gates of a government building. And not. Look back. Did she have someone with her keeping her from turning around and running back to that gate? Another mother, from a farm, who thought her baby girl was going to a local policeman’s family, only to find out later, she was gone, way gone. She never got that locket with McKenna’s picture in it. I don’t know why………. How do you not feel a little bit like you’re a thief on Mother’s Day? …. (I know the above is a provocative thought and if you are an adoptive parent and can relate … or not …. and want to talk about this comment in the comments section. I’m interested in others’ feelings and thoughts about this.)…. At the same time, I am also the mother of these cool girls. And I am grateful for their senses of humor, artistry, intelligence, and wisdom. Two possibly heartbroken women, at one time. And it took an awful kind of courage to do what they did. And I get to celebrate Mother’s Day because of them. So, when Mother’s Day rolls around, and we are thinking about our mothers, my mind strays to China and Vietnam and wonder how two other women are doing. I wish them much love. We have two great kids. There is no way to express the excitement I felt last week when I had an honest to God conversation in Vietnamese with my Rosetta Studio coach. It was AWESOME!! She asked me if I have any children. I told her that I have two daughters. One is from China and one is from Vietnam. Her eyebrows went up a little. (She understood me.) She asked me what their names are. (I understood her.) I told her. She asked me how old they are. I told her. (Understanding. Conversation.) In Vietnamese. I was thrilled out of my wits. There is almost nothing like the feeling of accomplishment you have when you have communicated with someone in their language. I have now gone through four Rosetta Studio sessions. And the last two just felt like a slam dunk. I knew all the stuff that I hadn’t known when I accidentally signed up for the first Unit 2 Studio session. Now moving into the 4th Unit and reviewing the 3rd Unit, I need to set up Studio sessions for both units. And I am not at all confident that I am ready. I have recently gone back to work after a lengthy medical leave during which I was able to really focus on learning. I made real progress on my Vietnamese study during that time. I am slowing down some now, not having the same kind of focused time to work on it. What I have found is that I can almost read tweets from @VOAVietnamese and @DaiAChauTuDo. 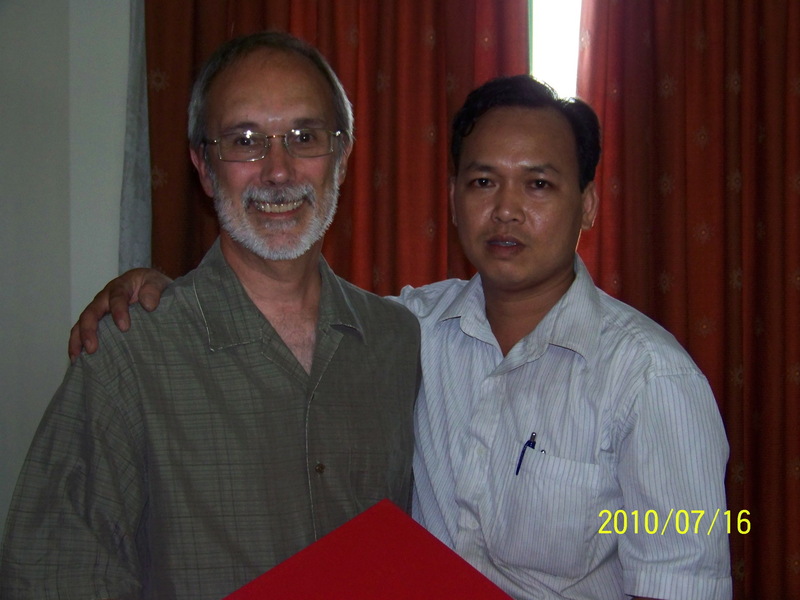 (By the way, , if you want) I am also able to go back and read some e-mails from McKenna’s birthfather in Vietnamese now. It is like unlocking another world or some wonderful code when you can read another language. And do you want to see something freaky? When last I blogged, I had just finished a difficult but satisfying Rosetta Studio session where I didn’t know this word and that word but managed to survive. Since then, I have worked with a wonderful Rosetta Stone Concierge person who clued me in that I had accidentally signed up for a Unit 2 Studio that evening. NO wonder I didn’t know what was going on! Rosetta Stone has started sending out a notification about what Studio you are registered for. I got one for a course I took today, but didn’t for the first one I took so there is an improvement they made immediately. I think the guy who was in the first Studio with me had the same issue as me. The poor instructor! What a bunch of noobs! Anyway, today, I took the Unit 1 Studio and had the same instructor and again, she was wonderful. But this time, I was pretty good too. 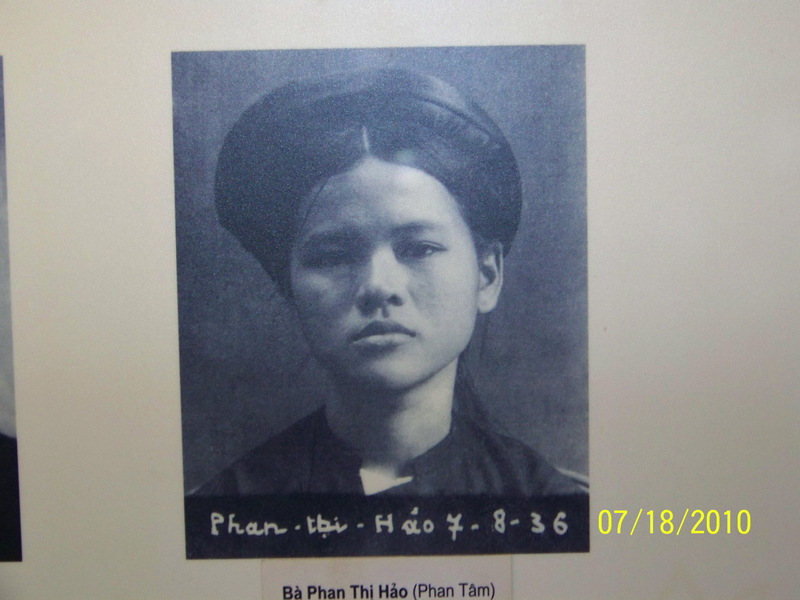 I knew what I was supposed to know and she even taught me a few things like how to say, “I don’t know.” “Tôi không biết.” Bless her heart………….. I will have to take the same Unit 1 session a few more times before I feel comfortable. I know the nouns. I know the pronouns. I am not as confident in the verbs. I have to say that I am only about halfway through the Level One Vietnamese software module and I completely feel like I have gotten my money’s worth. For those of you interested in hearing about the story of McKenna’s adoption and birthfamily, I have been tap dancing around starting that story until I get permission from her birthparents that it is ok for me to post pictures and how much they feel comfortable with me talking about. I can start the story by telling you that when we left for China and Vietnam on our big heritage trip last summer, we had given up hope of meeting McKenna’s birthmother. Hers was the only name we had. McKenna’s grandmother’s was the only picture we had (see above). The meeting, at the time, was so rushed and emotional we had not gotten her name. We had done some investigation that told us McKenna’s birthmother had moved away and couldn’t be found. About six months before, McKenna had been asking a lot of questions about her birthmother. Do you think she loves me? What if she is dead and I never get to meet her? What if she doesn’t love me? What if she has other children? I thought could probably answer the question about love. I was pretty sure that McKenna’s birthmother loved her. These questions also made me aware that McKenna needed or wanted some connection. 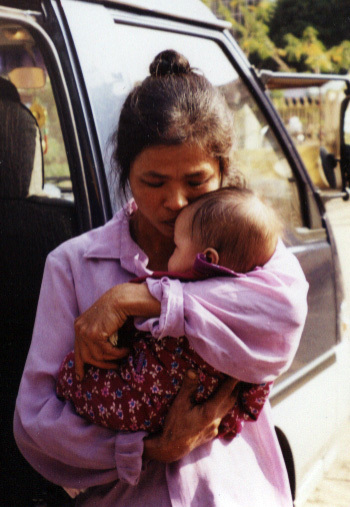 So knowing that we were not going to get to meet the birthmother in Vietnam was a disappointment. My own feelings about it were less complicated. There was another mother on the other side of the world who probably thought about her child. I wanted her to know McKenna was beautiful, had talent, was smart and was loved by us. 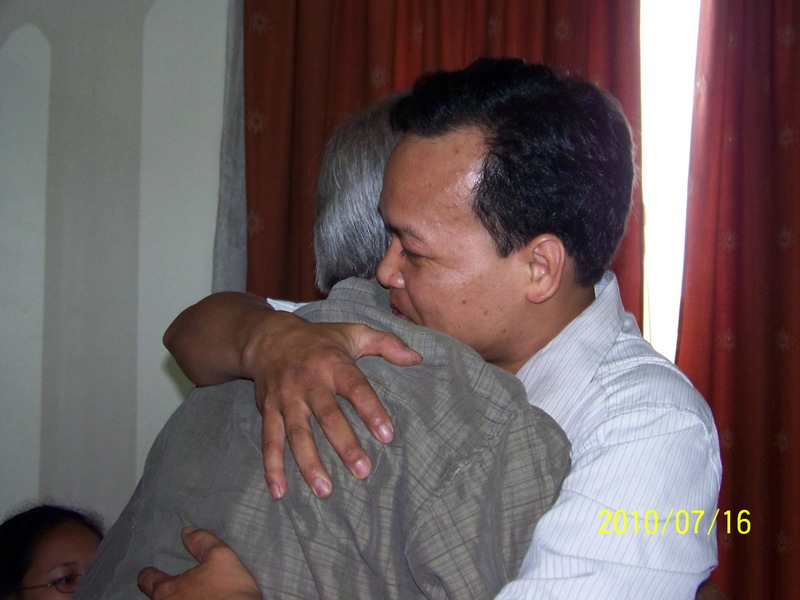 And I had made a promise to McKenna’s birth grandmother when we met for those brief minutes in front of the Ministry of Justice in Thai Nguyen that we would bring McKenna back one day. So the most I hoped for was to find McKenna’s grandmother and maybe find out some things about the birthmother. Màu gì là mái tóc của mình? I don’t the words for brown, orange, pink or gray. I don’t know how to say hair or eyes. I don’t know the words for short or tall. And I don’t know what I didn’t know on the first screen of my first Rosetta Studio session! But the instructor was gentle and nice and PATIENT. And I made her laugh when I said “the woman is drinking coffee” even though that wasn’t what she was asking! All in all I would say it was a good first session. But the whole thing is done in Vietnamese. The instructor WILL NOT speak with you in English. So. But I was able to answer a few questions. The yes or no ones!!!! OK, it wasn’t that bad. But you have to be ready to sit in silence for a few seconds while the other students wait for you to scratch your head and think to yourself “I have NO IDEA what she just asked me”. But then the next screen comes and you kind of figure out that she is asking what color is this and you kind of know some colors, so you start guessing. The teacher starts giving you hints and then eventually you blurt one out and she puts her thumb up to indicate that you got it!!! I am going to learn how to say “I haven’t learned that word yet” and “I don’t understand” and “What is…?” and “Could you show the words on the screen?” for my next session. Despite my feeling rather inadequate during this live session after spending hours studying the first two units and scoring in the upper 90’s in nearly every unit, I feel that Rosetta Studio is one of the best things about Rosetta Stone. When you buy one of their language software levels you get three free months of online access. With that you get access to Rosetta World where you can play games with other people learning the same language, read stories in the language you’re learning and take classes in Rosetta Studio which is what I did for the first time this evening. This is in addition to the software learning. The software itself offers lesson after lesson of reading, speaking, listening, grammar, pronunciation. It has reviews and recaps and extras and on and on. I thought the package was pricey but I can now see that I am definitely getting my money’s worth. The first unit took me about 10 hours to get through and was basic vocabulary and some basic grammar without giving you grammar rules. I am in the second unit now and we are into family and friend relationships, rooms of the house, countries, differences, setting the table and more. But getting to talk to someone during Rosetta Studio and hearing them laugh when you say “The woman is drinking coffee,” when that’s all you have to give and your instructor must know that and laughs at your sort of hopeless joke. BUT! You were able to say THAT AND she understood you!! A live native speaker understood you speaking her language. And later you accidentally tell her you’re tall….I will have to correct that perception at a later session! Tôi đang ngắn! I am short, Madame Instructor. And then there are the tonalities………. The thing that has me most impressed is how Rosetta Stone is teaching me the differences in the tonalities. Rosetta Stone will drill you on words and sounds that are very much alike and then it will play just one and have you choose which one it just played. So I am one step closer to speaking with my daughter’s birthfamily. More on how we met them in a later post. Màu tóc của tôi là ánh sáng màu nâu. Chào bạn. Tôi tên là Stephanie…. And these are my reflections on learning to speak Vietnamese. I am learning to speak Vietnamese using Rosetta Stone. I have tried all kinds of funky stuff on my iPad that is supposed to help you learn different languages but none of it is really any good. But now Rosetta Stone..! This is some good language learning software. And there a million reasons why. Before I get into why Rosetta Stone is so good, let me explain why I am even attempting to learn such a complex language at my age (that’s for you Steve Hart!). My youngest daughter is from Vietnam and this last summer we traveled to Asia and went to Vietnam, near Hanoi where she was born. Through an extremely lucky series of events, we managed to meet her birthmother, whose name we had, but who we had been told had moved away. In addition to finding her birthmother, we found her birthfather and siblings and grandparents. We all agreed to meet and luckily had a wonderful translator/guide/all around fantastic person Mr Long to translate to and from English and Vietnamese as we got to know each other. We got to meet three times during our time in Vietnam. To say it was memorable doesn’t even begin to do moments and revelations justice. We promised to stay in touch (somehow) having shared email addresses, and parted. It wasn’t until we received the first email from Thang (our daughter’s birthfather) with Steve and I addressed as ông và bà which translates literally to “grandfather and grandmother” using Google translate that I knew we were in for a long, hard ride trying to communicate. Xin chµo:stephanie vµ steve.chóc c¸c b¹n ngµy vui vÎ.stephanie v¸teve cã khoÎ kh«ng? Mck h«m nµo ®i häc,cã ngoan kh«ng ? mck ®i häc cã xa kh«ng ? T«i xin göi lêi chóc tèt ®Ñp tíi c¸c b¹n. Võa qua t«i göi tíi c¸c b¹n, bøc th u b»ng tÕng viÖt, c¸c b¹n cã ®äc ® îc kh«ng? C¸c b¹n th«ng c¶m cho chóng t«i.vÒ ng«n ng÷ dÞch vµ ch÷ viÕt cßn nhiÒu nçi. C¸c b¹n kh«ng ®äc ® îc. I have had to depend on others to translate the emails for me which has resulted in me getting teary in front of colleagues as they read moving text from our daughter’s birthfather. Not being able to say certain things in a room full of people with a translator….there….. So many things have led me to believe that I want to read and speak Vietnamese for myself. So I chose Rosetta Stone because like that midwestern farm boy I wanted to be able to speak to that French model. No wait….I’ve been reading too many airplane magazines….. I chose Rosetta Stone because I did research and they seemed to have the best method and they had a mobile version I could use with my iPad. Yep, for me it’s all about my obsession…. (another nod to Mr. Hart). I am going to end this first installment of my reflections on learning Vietnamese with the tantalizing observation that Vietnamese is a tonal language. So every sentence feels like a roller coaster which is pretty cool, actually. Tonight, I have my first live tutoring session with a Rosetta Stone native Vietnamese speaker. Wish me luck!